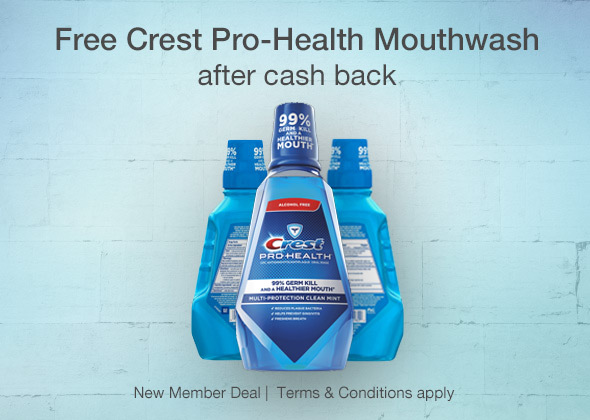 Top Cash Back is offering a FREE 1.5 L of Crest Pro-Health Mouthwash after cash back! Purchase the 1.5 L of Crest Pro-Health Mouthwash for $5.99 or more at Target via the custom TopCashback Offer Page and, get $6.40 in cash back! This is for new Top Cash Back members only. 2. Once you’ve successfully signed up, you’ll be redirected to the Crest Pro-Health Mouthwash Offer Page. Click ‘Get Offer Now’. 3. Purchase the mouthwash for $5.99 or more at Target + anything else and checkout. 4. Within 14 days, your account will be credited with your FREE $6.40 in cash back! 5. After you receive the $6.40 payment in your Top Cash Back account, you can choose to transfer it to your bank account or Paypal. Offer is valid through the September 9, 2017 — or while supplies last! So don't delay!! I like shopping at Target for my health supplies. My family does use Crest Pro and this is a super deal. I have to agree with you, I shop Target too for their great deals!